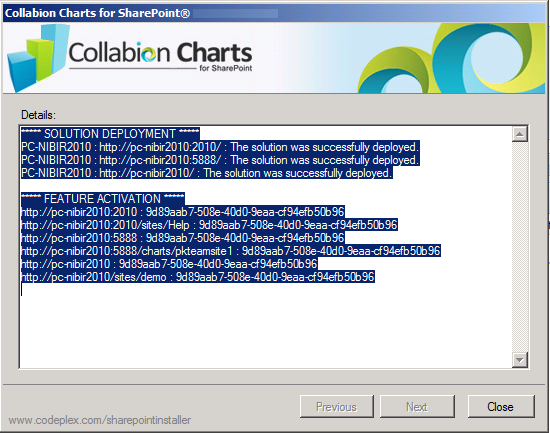 Collabion Charts for SharePoint provides an easy installation process. 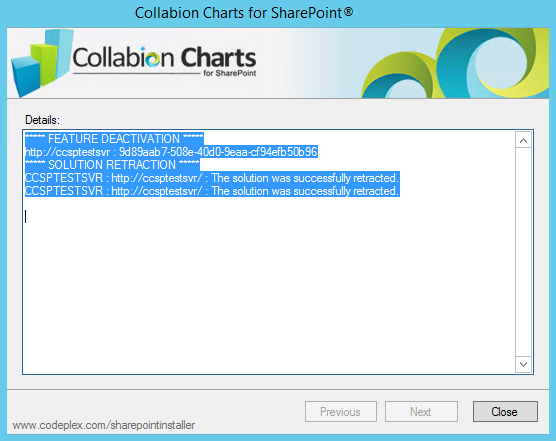 The download file varies based on the version of SharePoint you are using. Please select the appropriate download button. Once the System Check is successfully completed, click Next. Select the “I accept the terms in the License Agreement” check box to accept the terms in the license agreement and click Next to proceed. 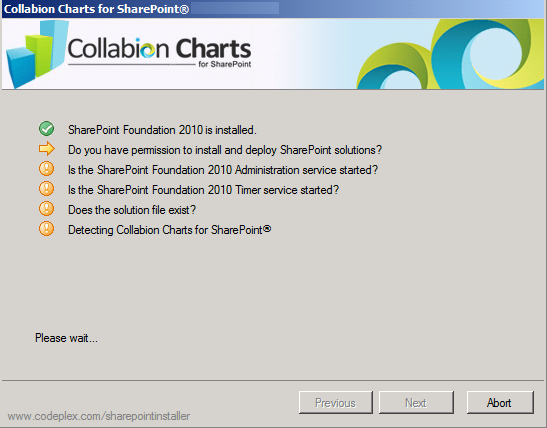 Select one or more web applications/site collections where you want to install Collabion Charts for SharePoint. Click Next. 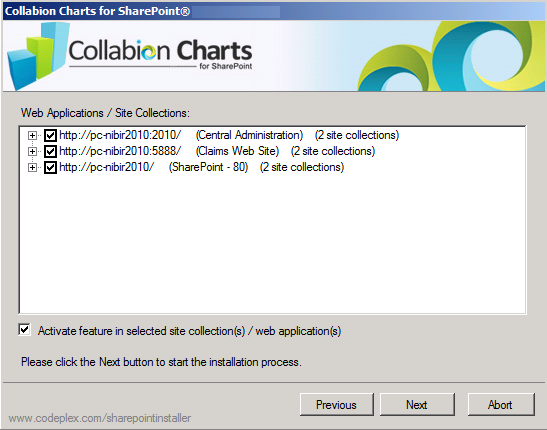 By default the Activate feature in selected site collection(s) / web application(s) checkbox is selected. This ensures that the feature will be activated in all the site collection(s)/web application(s). 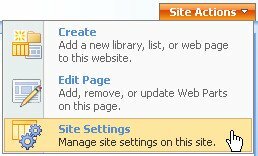 For example, in case of the above screenshot the feature is activated in all the 3 site collections of pc-nibir2010 web application. Open the default root site collection. 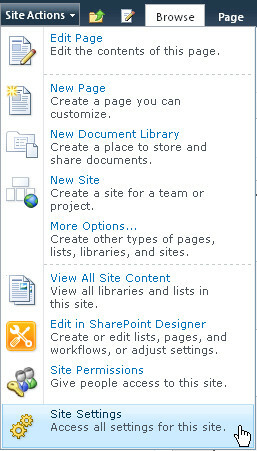 Click Site Actions drop down list on the top right corner of the page. 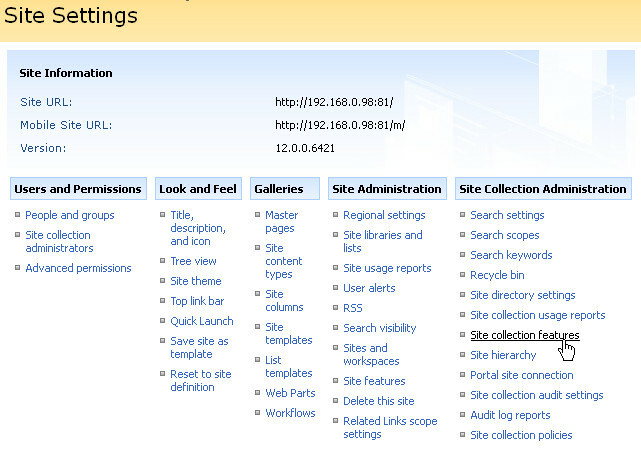 Under Site Collection Administration section, click Site collection features. Click Activate present beside the site for which you want to activate. For example - CollabionCharts for SharePoint. Click Site Actions drop down list on the top left corner of the page. 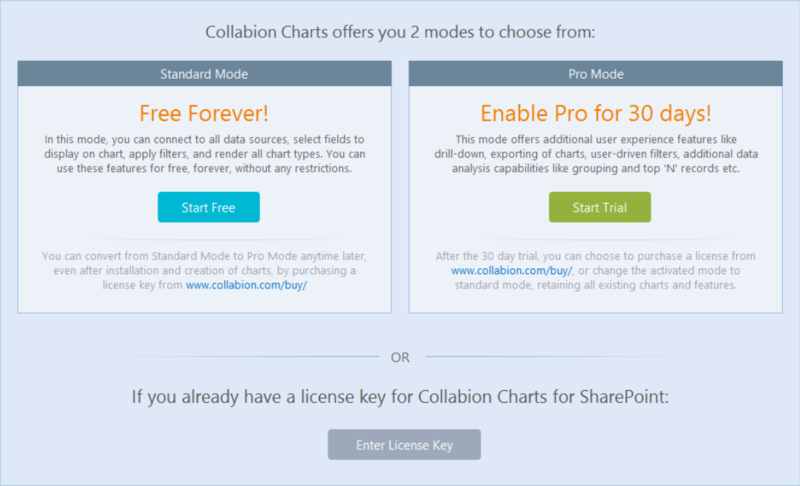 If you select Standard mode, then you will be able to use the Standard version of Collabion for FREE forever!. 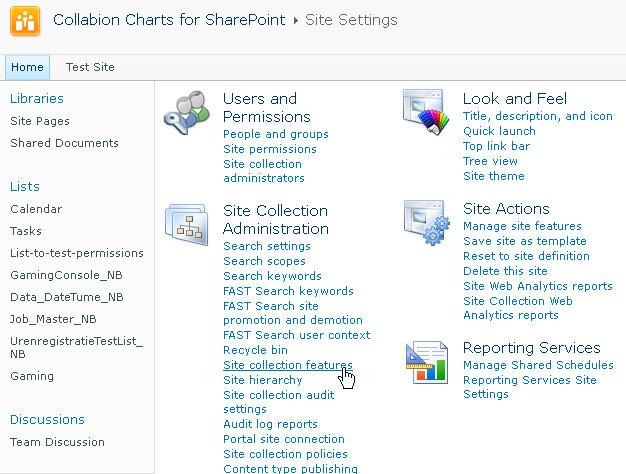 If you select Free Trial, you will start a 30 day free trial for the Pro version of Collabion Charts for SharePoint- without any feature restrictions.After this free trial period is over, you would be required to buy an annual subscription from Collabion to continue using all the features. 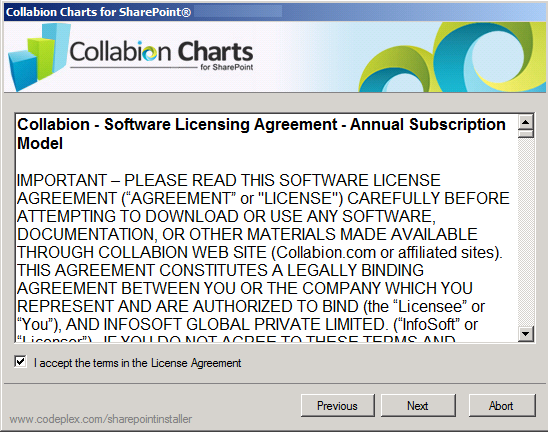 In case you do not buy a license, your Collabion Charts would be shifted to Standard mode which is free for life. 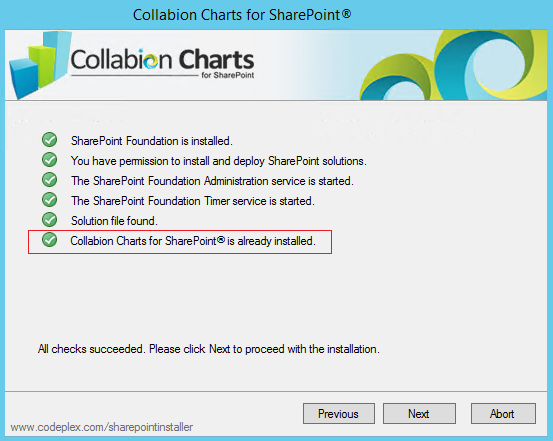 The Installation Successfully Completed screen appears showing more details on the location where you have installed Collabion Charts for SharePoint. 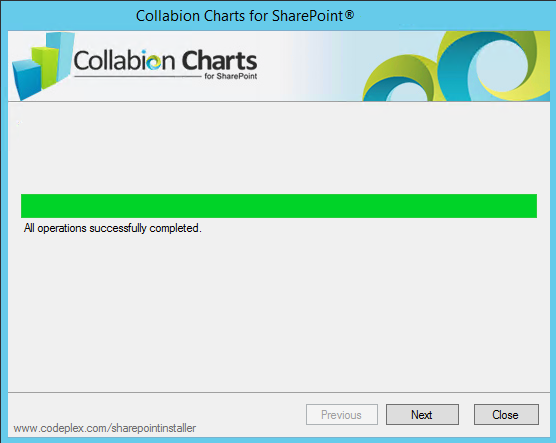 This completes installation of Collabion Charts for SharePoint. Please keep the downloaded installation file in a safe location, as you might require it to repair or uninstall the existing installation. 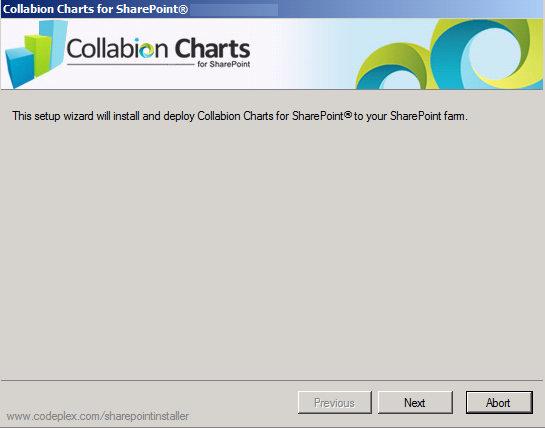 Uninstalling Collabion Charts for SharePoint also involves the same wizard used for installing it. Click Next. The wizard checks the system for existing installation of Collabion Charts for SharePoint. 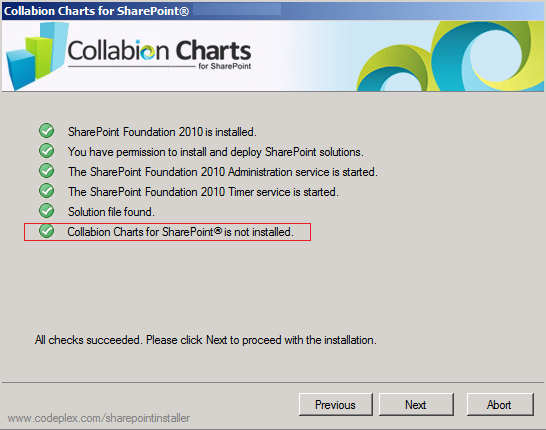 Once the system check is complete, the wizard shows a message stating, “Collabion Charts for SharePoint is already installed”. Click Next. Select Remove and click Next to begin the uninstallation process. This completes the uninstallation process. Click Next. 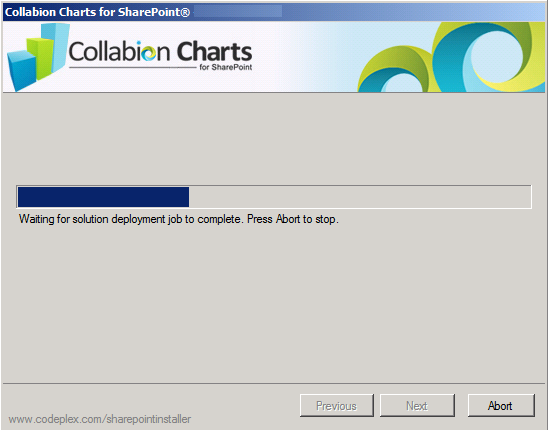 The Uninstall Successfully Completed screen appears showing more details. 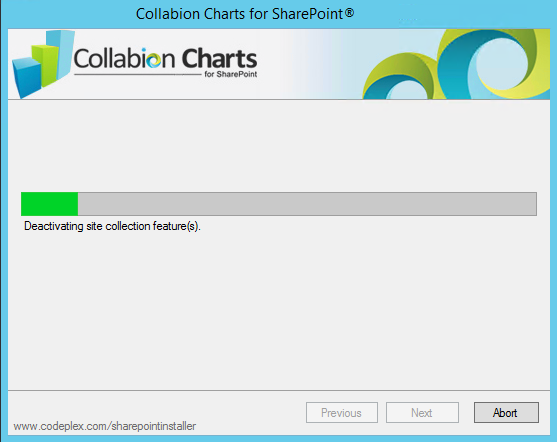 NOTE: The uninstallation process does not remove the charts created using Collabion Charts for SharePoint, so that you can get the charts back when you re-install Collabion Charts for SharePoint. 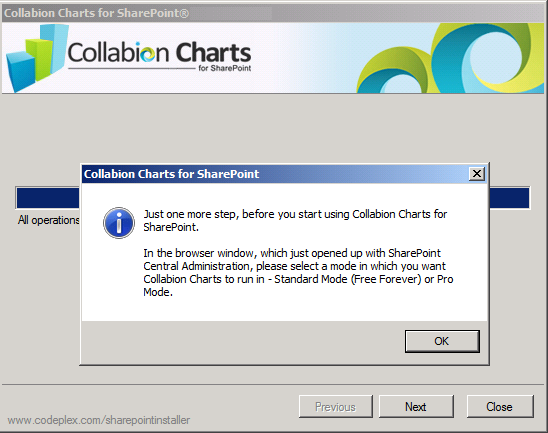 However, if you want to remove the charts, you need to remove the chart Web Parts from your pages.